The Mommy and Me Expo are happening this year at the beautiful and upmarket Venue D'Aria in Durbanville on 1-3 June 2018. Our visitor’s ranges form 0 - 70 of age, parents, grandparents, godparents, babies, toddlers and small children. 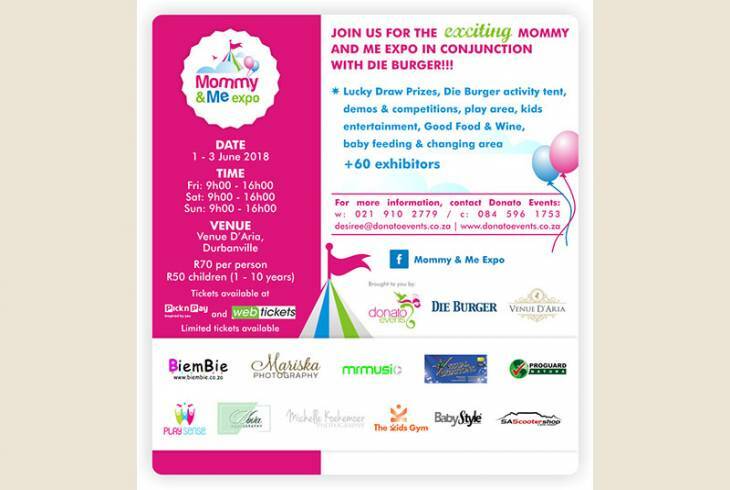 You can expect DIE BURGER ACTIVITY CENTER, a play area by BiemBie Toys, entertainment for the kids, 60 top quality exhibitors, good food and wine by Venue D'Aria, WIN-4-your-Family lucky draws, exhibitor’s competitions and demonstrations, informative talks, baby feeding and changing area and much more. The Bop Boppers, Regard Laubscher from Master Magic, Photobooth Station, Nadine Blom, Bennie Boekwurm and Haas Das readings , Flashmops, face painting, sand art, etc. Entry costs just R70.00 for adults, R50 for children, which includes free entry to the DIE BURGER activity centre, play area and entertainment. Children under 1 for free. Only limited tickets are available for each day, so hurry and buy your ticket NOW!!!! Parking for the full day is for free. The Mommy n Me Expo will present a variety of products and services, from healthy advice and nourishing tips, to cute products and fun services, to educational and learning activities. Clothing and shoes, nursery décor and furniture, toys and useful equipments are only a few to mention. For the more serious side we have financial solutions, security options, CPR education and safety programs, daycares, programs, and much more. Each stage will be provided for, from maternity, baby, toddlers and children. Not just another Expo, but a way of making your life a little easier. Fairhaven Guest Accommodation is situated in a peaceful suburb of Durbanville, Northeast of Cape Town. The garden cottages are in a safe, fully enclosed, spacious garden entered by an electric operated gate. There is a large swimming-pool and braai..
Clouds, is a 3 star graded and AA highly recommended guest house with free Wi-Fi, DSTV, secure parking behind an automated gate and a dependable laundry service. Walk to the nearest shop or take a short drive to the many restaurants and the popular.. Situated in Parow-Panorama on the slope of the Tygerberg hills with a beautiful view of Table Mountain. Our 1, 2 and 3 bedroom apartments are welcoming, and in a secure complex. Mommy & Me Expo 2018 Information and Nearby Accommodation.